This 4-bell sacristy bell delivers a pleasant and silvery sound while making a joyful noise unto the Lord. Each bell is the same size and has one bell clapper. The carved design of birds singing in a tree handle is for a stable and secure grip. 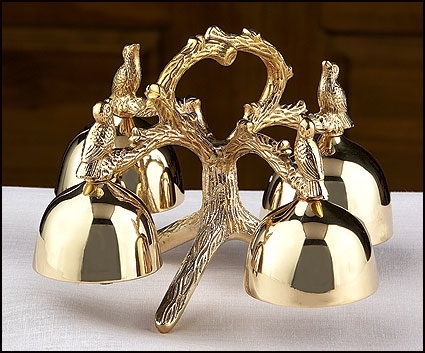 These sacristy bells, made of brass with a high polish finish, are a must for your worship space.